Has anyone had a reading with Marisa Ryan? 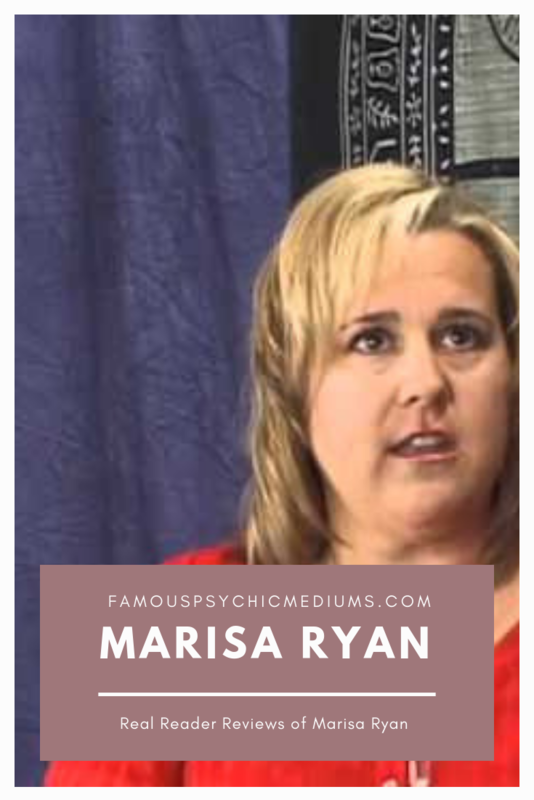 Check out Marisa’s listing below – and as with ALL of the psychics, mediums, clairovyants and spiritual professionals we feature, if you’ve had an experience or a reading with her, we’d love to know what you thought! I wanted to leave this very important message regarding Marisa for anyone considering a reading with her: make sure to use a pseudonym when filling out her online contact form AND use a friend’s phone number for the contact number and reading! I was intrigued to find about half of the folks here think she’s a fraud and the other half think she’s awesome. Here’s my story: I had a 15 min reading with her and from the get go, she was spot on with identifying my parents who had passed, siblings’ names, specific info about my parents, etc. I was so amazed that I thought I had just had a reading with the world’s best psychic! In my life, I have probably had about 20 readings with different psychics, several of them quite good, and I’d never, ever seen this kind of accuracy in terms of names. Boom, boom, boom, she just rattled off those names: dad, mom, sister, brother, my legal name (I have a nickname that I use) even my great niece. I was thrilled, feeling like my parents were right there connecting with me. It was very special. Another interesting point: not once, but twice, she said I was intuitive and could do the type of work she does which I felt was her way of hooking me into taking one of her classes. Did anyone else have that experience with her? Then the unexpected happened: about an hour later, after I’d called at least one family member and a friend to rave about this amazing experience, while sitting quietly, an unexpected but powerful thought came into my mind: “OMG, what if she researched me online before the session? ?” It just never occurred to me! Slowly, but surely, it dawned on me that everything she shared was probably available online. I didn’t think it was FB because I have my account available only to FB friends. So I did a search under my name and there it was, at the bottom of the first search page, BOTH of my parents obits and it was all there (my brother wrote up incredibly detailed obits). Siblings names, specific info about both parents that she shared (in fact the only info she shared about each of them was in those obituaries), even my little great niece who at the end of the session she said “Your mother says ‘Give X a kiss for me.’” (that one blew me away because she used my great niece’s very unusual name). My heart sank. I mean really sank. She seemed like such a wonderful woman from her YT vids, how could she do this? The feeling was overwhelming that she had researched me before our call…oh and I want to point out that like the woman in one of the comments above, she also told me I had a Native American guide…emphasis on feathers. I wasn’t mad, just sad that this great connection I thought she had with my parents was a sham. Here’s what I think: I think Marisa is really a psychic medium. I’m sure she has done cold readings that are really amazing. I don’t think you can work with a police department or have a strong reputation as she does, without having some ability there. But I also sense that she does this online research when she is able to just enhance the appearance of accuracy in her readings (it sure blew me away!). There was only one thing she shared in the session that might have been authentic (ie. the only thing that wasn’t online)…it was fairly vague but I thought it might be legitimate. Of course, I can’t PROVE that she researched me online before our reading but she had my name and at least several days to look me up. I really WANTED to believe she hadn’t but in my gut, I really believe she did, primarily because every little detail she shared about my parents was in those obituaries. Too obvious. BOTTOM LINE? Try her for yourself (stick to the 15 min session for $75 so you don’t lose too much) but make sure you use a pseudonym and someone’s else’s phone in the online submission form for your session just to see if she really is legitimate in your reading. Maybe you’ll be like one of the lucky ones above, who said she knew things that were not online and who had great readings. Your post was very interesting. I understand being weary of the fact that she may have researched you, but I have to say that I met Marisa for the first time at a psychic retreat and she didn’t know me or my name. Marisa’s reading for me was so accurate that is blew me away!!!! This was several years ago and to this day I will never forget it! She knew things that no one else could ever know. I don’t feel like someone with this much talent would spend all that time researching everyone so she could give a fake reading. I just had to reapond to this post because I think Marisa is a true psychic and I have experienced it first hand. For what it’s worth – one of my pet peeves in life are people who hang up the phone without a proper “goodbye” 🙂 Some of the people I love most in this world – haven’t mastered the art of ending a phone call the right way – it makes me laugh – but drives me nuts when it happens, too! Thanks again – much appreciate your review – and thankful that the other reviews here didn’t dissuade you from having a good experience with Marissa Ryan as well. This woman was so good I was thinking she had to have googled me with my info prior to the appointment. Interesting however is she also knew people Involved who would y be so easy to find and, her statements at times regardjng the relationship dynamics which are not researchable were dead on. How she knew one of my sons was somewhere In Kansas or Oklahoma driving my red truck is not possible. Truck is not even I. My name but the companys name along with 20 others and not all alike. I have also given her a referral without name and phone number which was in a relatives name and she told me Marissa was right on. My sons too would find the same. Just Almost too good. Even found out about …my wife’s leaning toward lesbianism after 33 years. She is gifted and doesn’t cold read.like the fraud Teresa Cavuto or the Hollywood Pyschic kid do and yell out, im feeling the name which starts with a B and is heart attack related and was a husband or father to someone here . No she is t like those scammers. But damn just knew alot. In th end, I keep returning to her. I paid for a 15-minute reading with Marissa and the word disappointing does not even begin to describe my experience. She told me the usual you have so many people who love you on the other side. Nothing specific all very vague and open-ended statements she was Desperately Seeking for something that hit for me. She tried to give me validating information as in hair color of people or size or stature. Every single validation was off. Just super disappointing and I feel like a fool for sort of taking it so seriously and I should be honoring my mantra. Blessed are those who have no expectations for they shall not be disappointed. I’m attending a small dinner party with a few friends tonight and a man who claims to have the gift of mediumship. He won’t take any money and just wants to share his gifts with a small group. That’s tonight I can’t wait to meet him if nothing else at least it will be nice meal and some social interaction. At best I’ll get to experience someone who is really gifted and want to share their special talents with others. Save your money don’t book with Marissa. My grandmother was a true psychic medium and never took a penny from anyone. She helped many people. It is hard to find any that do not charge. I guess it’s hard to find a therapist, etc. who do not charge. Who do you think you are anyway? You are pathetic thinking that because a person is in this profession that they should not be compensated for their work! PLEASE!!!! Would you expect not to pay your dentist or even your grocer? Mediumship is real! BUT After watching her youtube video it is clear that she is a fraud. There was not one shred of evidential verifiable information in her entire “performance!” It was heartbreaking to me to listen to people who were genuinely grieving about their loved ones and wanting to believe her so badly. One thing is for certain, one day she will have to answer for her trickery and greed when she gets to the spirit world herself. If she were the real deal, she would not take your money for a bad reading. Huge lack of integrity there. Wow! You are so wrong! I met Marisa at a psychic retreat, she didn’t know me and gave me the most amazing reading of my life! She knew things that no one could ever know. She spoke to my father who has passed on. You don’t know what you are talking about! Marisa is by no means a fraud or a fake!!! What you said in your post was rude. When you signed up for that psychic retreat, what information did you provide prior to attending? Did you sign up online, buy a ticket online, use a credit card to buy the ticket, put your info on a sign-in sheet when you arrived, etc? I haven’t been on a retreat for years so I don’t know how it all works these days. However, I might guess there is a list of names, addresses, and phone numbers of anyone who would be present at this retreat. The ONLY way I could believe they had no personal info on you is if you just showed up day of, paid cash for the ticket (unless, of course, it was a free event), or someone else bought you a ticket under his/her name. Even audience members for tv show recordings have to provide their info. I cannot imagine any organized retreat would just allow unnamed walk-ins. But like I said, I have no idea so just want clarification. Thank you! I had a reading with Marissa 5 months ago and it was the most amazing experience ever. I first contacted her because I wanted to know who is/are the spirit(s) in the house whom are turning on the tv, microwave, fans, knocking over flower stands, and ripping the poster off the wall. I use to be very skeptical about spirits and mediums until this all started to happen to me. But what I got out of the experience was so much more than I would have expected. She knew so many details that you can NOT find online about me. The morning before the reading I was emailing graduate professors back and fourth and it was making me feel lost and confused since I did not know which one of the 2 schools I was applying to was going to accept me. The thing I was worried about the most was my statement letter to the school I had no clue what I was going to write them about. That afternoon I had my reading with Marissa and how did she know I was applying to Texas Tech?? She also told me my letter to the school was going to be amazing and how would she know this?? She said I was going to get into Tech and WHAT DO YOU KNOW I am leaving for Texas in August! She did identify who the spirits were and why they were doing the activity in the house. One of the spirits that came through very strong was my grandfather, there is ABSOLUTELY NO WAY she would know that he called all of this spiritual stuff “hocus pocus” and that to tell my mom (who was with me at the reading) not to worry about me going to Texas. My mom has been so against me moving to Texas and this reading also gave her peace of mind that I will be alright. Marissa is truly a blessing in this world. For those of you that had bad readings I am sorry but maybe it is not her it may be the connection between you and your family/friends. There is no price that you can put on the feeling of complete peace. I recently have had a spike in more paranormal activity in the house so I am also making another appointment with her soon. I never believed the possibility of channeling dead relatives until my cousin told me about her. So I set up a phone appointment with her and the things that she told me no way you can research it online. She not about taking your money! She tells me where to go to get accurate reading and avoid frauds, by recommending mythohysical shops. So far I know four people who have been to her and they are all amazed by the things she says. She is amazing and a gift to our society! Wow, you all need to understand that being “psychic” is not a circus act that is always the same. I, myself am pretty psychic and have some mediumship abilities. I know they happen when they happen. I had a reading with Marisa a couple of years ago and found her to be quite competent and friendly. I would recommend her and would welcome another reading. When reading the reviews on this profile – please take into consideration – and ask yourself why (and who) there are numerous fictitious/fake and repetitive postive reviews being posted from a single computer, using multiple email addresses – to “game” or “trick” our community. I had a reading with Marisa a month ago and thought she was amazing. I didnt tell her my real name so she could not have looked me up. She contacted my deceased brother and knew his first name, that he was married and had 3 children. None of this could have been found through a search. She was very pleasant and seemed very honest. She described my brother as if he was standing in front of her, even the large mole on his cheek. She knew about a strange game we used to play when we were kids and she knew how he died. The reading brought me great peace of mind and validation that it was my brother. She even knew I drove a old truck with a camper shell on it. How would she know that. Amazing. Sometimes you have to just own up to the fact that we dont really die and people like Marisa just want to prove that to us so we can find peace knowing we will all be together in the end. Those of you that dont want to believe, I am sorry for you. Bud. I can only share my validating belief that Marisa Ryan is gifted with something most of us are not capable of. It all started with in the first few minutes of the session-Chocolate. Out of all the things she could have started off saying-Chocolate. Now let me explain, as Marisa Ryan respectfully starts her session and takes a few deep breaths, I decided I was thirsty and needed to quench my thirst. Before I even opened the fridge door, she mentions Chocolate. I was standing right in front of a huge bar of Dark Chocolate and some Ferrero Rocher. What are the odds right? To top it off, I’m not a huge chocolate fan but for some odd reason the night before I wanted some chocolate… at 1am even. Out of the ordinary for sure. Odds of this happening, not very likely. I would just hate to be in the bathroom and have her say something about toilet paper, I have a feeling that she would just know. Don’t just go by the reviews, decide for your self of course. She’s a pleasant speaker that gets right to the point, she has a fun way of explaining things. Actually speaking with her makes time fly so fast. I hope she stays healthy and lives long because I think she’s done some good in this world and who can’t appreciate a person that try’s to dedicate them selves trying to help others. If “chocolate” impressed you then I would say you are easily impressed. It wouldn’t impress me if that is all I got out of a “psychic” reading. You could always schedule an appointment with her and form your own experience if you like. Sorry I if my comment was not what you were looking for, I’ll make sure I’ll do better next time. Let me work on realizing what I got out of my reading with Marisa Ryan. I watched her entire YOUTUBE show and I discerned rather quickly that she is a CHARLATAN. She is a bad cold reader and apparently a pretty bad hot reader as well, her schtick is sickening and it makes my blood boil to hear the audience oohing and ahhhhing and laughing at her ridiculous jokes . Watch her close, she brings not one message that is unique, verifiable or useful. She is probably one of the worst I have ever watched ( probably because it was an unedited clip) ALIENS??? Please, show me some sort of proof, anything at all for your unearned fame and ridiculous ego. After thinking about it some more, I want to amend my earlier review of my reading with Marisa Ryan. I want to say that I believe she is a complete fraud. In our one hour phone session she was making up visiting dead friends/relatives,scrambling around and trying to say something I would leap on (“Somebody in the military”). There was NO validating information whatsoever. The few things she threw out to me made no sense.. I recognized nothing at all about any of the five “spirits” who so “wanted to talk” with me. She started out by saying “There are SO many people who love you!” Funny, one of the questions I had lined up to ask Marisa was “why don’t people like me very much?” When I told her this she replied “people are intimidated by your independence”. Later she said,”People are put off by your forthrightness.” Wait, what? I thought they loved me! So MANY! Marissa told me one of my 3 spirit guides was an old, Native American male. She said he wants me to pay attention to feathers (not sure why). I told her I have pet birds in the house, so feathers are always around. Then she told me I should pay attention to them outdoors (still don’t know why), and I told her I have a flock of geese living on my property (my pets). We moved on from that subject after she told me my spirit guide said I own “small grey birds”. (I own two cockatiels, one yellow and one mostly grey, and two very brightly colored, mostly green conures”. I call that a *miss*———and who cares about this stuff anyway? What a waste of $225.00. I asked about my childhood injury to my finger (now permanently disfigured) which I had no recollection of and wanted to know about, and she said it was slammed in a door….or caught in a piece of machinery…..or something…..she’s not sure what—but she ‘heard” two screams! Mine and “the adult” who was with me. Not my mother. Or my father. or a grandparent or a babysitter—an “adult”. She also said I was “under four years old”, which I already figured, and I had told her that was too young to remember. I wanted to know my age– six months? one? two? three? “Under four” was all she came up with. She’s a fraud, and I promise you, I don’t say that lightly. Or she was having a hella off day. But were it I in her shoes, had I been the real deal, I’d have said, you know, this is a real off day for me, clearly, so why don’t we reschedule this again for another day and let’s see if I can do a better job for you. There wasn’t a single insight or genuine validating piece of information that came through in an hour’s time, and more than one contradictory statement. And when the hour was up, and after all of those misses, I asked if she would answer ONE more question, to which she replied, “I have to go”, and, boom, she was gone. Two hundred and twenty five dollars richer. And I feel like a joke with my hopeful anticipation and my carefully thought-out list of questions. P.S. One thing Marisa said which made me very annoyed (and suspicious), was that one of the “spirits” who was trying to connect with me was showing her “guns” “and the word Sandy Brook or something like Sandy Hook which is where he lived, or you live………..” Well, I do live in Newtown, CT. where the Sandy Hook School children were murdered (something easily discovered by looking my unusual name up on the internet, along with my area code)—-but WHY would a so-called spirit come forth from the spirit world to tell me where I lived anyway? He’ll tell me where I live but not tell his own name? After receiving no positive feedback or recognition from me regarding the five spirit people who were so “eager” to talk to me, she pulled that out of her hat. WOW. An unknown male spirit (who, btw, loved me very much in a romantic sense) came forth from beyond to tell me I live in Sandy Hook–or he did.. It felt very much like she was grasping at straws. There is no such person from my past who has crossed over. Well, people, you be the judge. There is only one “psychic” have ever dealt with who I feel truly has psychic ability, and I’d hoped, through Marisa, to have some of the unknown things she’d told me validated. There were many known things that psychic did validate, which makes one pay much moe attention to things that can’t be validated. Only if two different, unconnected psychics give you matching information can you feel, well then, you’ve got something there! My one hour session with Marisa did not go well. “Spirits” came through whom neither she nor I could identify, with no real messages coming forth. An answer to a query about a childhood injury was so vague, and it differed from the answers I received from two other so-called psychics in the past. I was hoping for a consensus, but it looks like it’s not to be. In the hour’s time there wasn’t one significant thing she told me—not one—that impressed me as having the ring of truth. I don’t believe Marisa is especially gifted. I read a newspaper article about her. She said it was in Riverside County California and she claimed she never solved it she worked on the case with the police. I’ve had one session with Marisa. After hearing her interviewed on the radio, I contacted her and made an appointment for a half hour spirit communication session. Her insights were outstanding, and the whole experience was very validating and uplifting. I will more than likely book a reading with her again. She is top quality. I’ve had several readings with Marisa, after a friend told me about her, he interviewed her for an article. I was impressed with what she said in the interview, paid for a reading and was BLOWN AWAY. She knew nothing about me, asked how I got her name. Then with no questions from me, told me very personal info. and advice for 20 minutes (it would not have fit anyone else I know), then asked if I had questions. She is superb. Utterly superb. I foolishly paid for a reading. EVERYTHING she told me was information available from Google, Pipl, Ancestry, etc. She had a two week lead time to research me, and I did the same. She found ALL the same things I found about myself. When questioned about anything beyond this info, she claimed “my spirit guides wanted me to consult them myself”. I sent an email after requesting a refund and she did not reply. I have documented everything she “read” and where she obtained the info online. Shameful fraud. My bad!! Don’t make the same mistake. Just pray to God and save your money. I totally agree. I felt so violated after the reading. She was struggling and then all of a sudden starting reeling off names right in a row. It was SO obvious she was looking at face book after finding out a little more information on me during the reading. I was so disappointed and want people to know what a bad reading it was. I love having readings and have never felt like this before. Hi I just recently booked an appointment with her.. this is the medium in California ? Same one ? OMG!! Seriously? I met Marisa at a psychic retreat and she didn’t know me nor did she look any info up on me before my reading. She was so accurate it was scary!!!! She is an amazing and gifted psychic! People like you are suspicious and rude!! Well I do believe all of us have psychic abilities to some degree. The “professional” psychics have supposedly mastered this ability to a higher degree, but can it really be used “On Demand”? After my 15 minute reading with Marisa Ryan, I have come to the conclusive answer as No! She said she only felt one spirit coming through and it was a male, native- american warrior with a message that I should use social media, namely Facebook to help my business grow. Really? That’s it? Being a business owner, I already know this, this is not new or unknown information. Nothing spiritual whatsoever. After my call I felt like Ralphy in the movie Christmas Story where he is so excited to uncover the secret message when he got his decoder ring, only to find the message is “Drink Your Ovaltine”! I would have rather given my $75.00 to a homeless person. I would have felt much better. That is pretty insane, Jay! I’d actually ask for a refund if that is the sort of superficial silliness she shared for $75 – and I dare say – the sort of “psychic reading” that makes it so easy for skeptics and cynics to completely disregard the entire field. A shame – but I’m glad you shared it with our community – so others can benefit from your (bad) experience with Marissa Ryan.